Qu-Pac, Munro Sonic Egg 100, Royer SF2, Acidlab Drumatix. Techniques: Richard King: How To Record Acoustic Ensembles, Mix Rescue, Session Notes. Features: Inside Track: Daniel O‘Donnell, Studio File, John Chowning. In 1939, Shure revolutionised the music industry with a microphone so successful that it is still in production today! Acidlab haven’t just recreated the Roland TR606 — they’ve made it better. With their strong live–console pedigree, Allen & Heath are hoping to tackle the burgeoning iPad–controlled mixer market. Fancy a little Smack? Then think again, because Smack is a rather neat virtual instrument sample library . This head–turning new mic from Blue helps you reach the places other mics can’t. Need a professional drummer in your studio? How about auditioning EastWest’s ProDrummer for the job? Is the Electro-Harmonix Super Pulsar the most sophisticated and versatile tremolo pedal money can buy? With so many different interpretations of the venerable PulTec EQP-1A now available, how does this one stand out from the crowd? The market for mini mixers may be crowded, but Kinsman’s entry offers an excellent balance between affordability and ruggedness. Is this the most faithful imitation yet of the fabled Uni-Vibe effect? It’s Dangerous Drums is a sample pack released by German EDM DJ/producer Marco Scherer, and based on the sound of acoustic drums “morphed with synthetic drums. The Ottobit offers further proof that the 500-series needn’t be restricted to the niceties of analogue gear. Digital amp modelling has come a long way, but some guitarists still miss the ‘feel’ of a real amp on stage. Enter the Gemini 2. Following his success with the Egg 150 monitors, Andy Munro is back with a new, compact design. Can they beat the competition? Neumann are known for producing outstanding microphones, and their new flagship monitors are no less impressive! Ogre’s Tubeholic pedal overdrive contains neither tubes nor, as far as I can tell, any alcohol. It does, however, feature 440g of barking-mad cast metal as its case. Founded in 1945 by EMI producer Walter Legge, London’s Philharmonia Orchestra is world-renowned for its musical achievements, but what you may not know is that it also has an impressive web site which provides many tools that may be of interest to recording musicians. Prism Sound’s Lyra brings the quality of their Orpheus and Titan interfaces within reach of lesser mortals. With its familiar interface and enormous potential for expressive control, is the ROLI Seaboard the future of the keyboard? Does the sound of Royer’s flagship active mic justify the asking price? We put it to the test. The German manufacturer RTW has a long history in the broadcast sector dating back to 1965, mostly in the areas of specialist metering systems and equipment interfaces. These files accompany the Sample Shop articles in the September 2015 issue. Want to cut loose? We try out Sennheiser’s latest licence–free digital wireless systems. The digital mixer market shows no sign of slowing down. We round up some of the latest options from the biggest players. Oracle is billed as a “modern sound design” library of large-scale elements to pump up your TV, film and game scores. Speed up your work by tailoring Sonar’s look and feel. Working with MIDI controllers in Ableton Live. The art of music production lies in serving the song — and working with James Taylor, Dave O’Donnell felt that modern production trends would hinder his aim of capturing emotive performances. Memory Locations in Pro Tools don’t have to be tied to the timeline — they can also store and recall a host of session parameters. Malenky Slovos from Italy: There are times when achieving a satisfying mix requires a lot of creative input — not to mention some extreme effects! As Reason has evolved from a compact synth rack into the incredibly powerful DAW it is today, its user interface has necessarily grown in size and complexity. 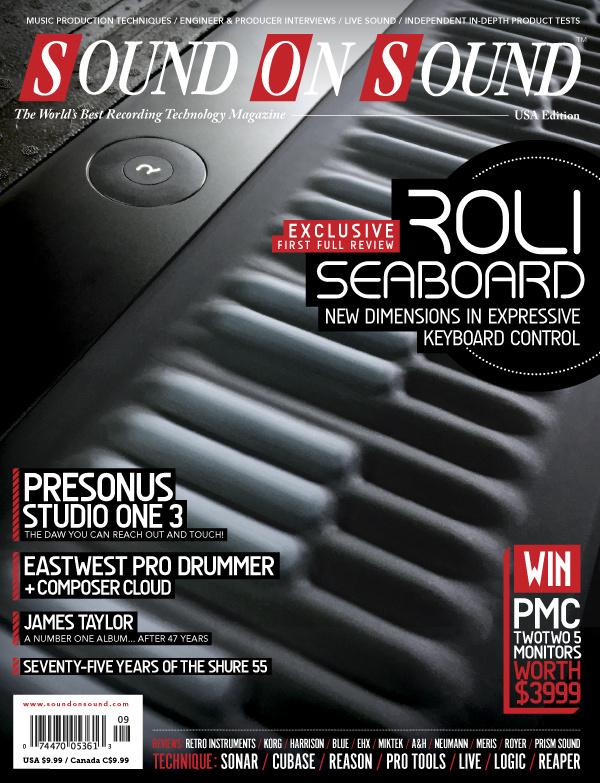 Learn how to customise and navigate Reason’s user interface. Brass on location: Our engineer tracks a trombone ensemble and solo trumpet for use in a contemporary rock mix. This month's selection includes: Philip George, OMI, Wiz Khalifa, James Bay, Sia and the Classix Mix - Shania Twain ‘You’re Still The One’. Learn to map custom touch controllers with an iPad and Duet Display in Logic Pro X. Ever since audio recording was invented the recordings themselves have been tied to a physical format that, despite its physical failings, has given us some kind of psychological reassurance in the longevity of those recordings. We visit the world-famous Blackbird Studios in Nashville to meet Jacquire King, the Grammy-winning producer of James Bay’s Chaos And The Calm. A visionary in the field of electronic music, John Chowning invented FM synthesis and set up CCMRA, one of the world’s most influential research centres. Engineer Richard King has brought the art of ensemble recording to new heights in both classical and folk/pop spheres. Better gear always equals better recordings. Doesn’t it? Location sound recordist Robin Bigwood offers an insight. This month’s Notes From The Deadline is brought to you by former DJ, apprentice sound engineer and guest columnist Terry Trihard. Thanks to new legislation, gainful employment now means just that for academies and students. Tony Maimone laid the foundations for what has become one of New York’s most interesting recording venues. Media content for the September 2015 issue.